Good subfloor ventilation improves the health of your home by reducing airborne fungal spores. 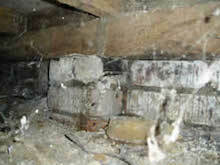 Many Federation and Edwardian brick homes have a musty smell, originating from poor underfloor ventilation. This is often compounded by underfloor ducted heating systems which further reduce natural air movement. 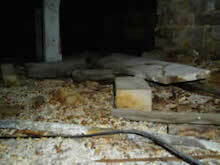 Ducts are sometimes left in contact with the ground causing heat loss and local condensation. 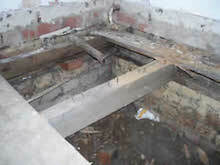 Heating ducts should always be off the ground and strapped to the floor joist. This increased moisture is also enough to attract foraging termites and decay fungi. Exopest can simply install Eco-friendly, solar-powered or low-voltage 12v subfloor ventilation systems. The difference is immediate, the energy running the system is free from the sun (for solar-powered systems) and results in a damp-free environment with no carbon emissions. Exopest recommends improving subfloor ventilation, particularly where the building has a damp or odour problem under the floor. Frequently people look at the air vents and assume the vent is working efficiently. This is often not the case. Good subfloor ventilation improves the health of the occupants by reducing airborne fungal spores. 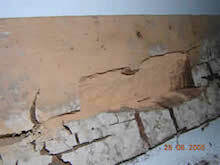 Old-style terracotta vents in double-brick homes are notorious for being partially blocked or in poor working order. There are only 15 small holes in each terracotta vent, each one the size of your little finger! 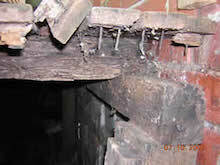 Loose mortar falls down the cavities during building construction; debris and dirt accumulate in the vent over the years and gradually block up the opening. Often there is no opening at all behind the vent – only a brick wall. Exopest recommends replacing the terracotta vents with Aleta high-flow vents. They are the same physical size, but they create six times the air flow and they are easy to install. Download the Aleta Vents information sheet. With a brick-veneer home on a timber suspended floor we often find the back of the metal air vent is blocked by the floor bearer because the vent is positioned too high on the external wall. As well, the practice of using ‘slit bricks’ (bricks on their sides with a gap between them) rather than the builder installing proper air vents is not recommended because the small opening between the bricks blocks up. This situation can easily be fixed by knocking out the bricks and installing Aleta high-flow vents. In order to counteract foraging worker termites, which are attracted by moisture, Exopest uses solar-powered or low-voltage 12v electric fans and air vents to maximize subfloor air flow. Subfloor fans and vents also reduce mould and fungi growth (see the photos below) under the floor and discourage foraging termites and borer attack. A small solar panel (400mm x 400mm) is mounted on a north or west-facing roof and connected to the fan unit in the external subfloor wall. The dual fan unit is the size of a normal house brick, but moves about 2500/2750 litres of air a minute under full sun light. Being 12v the fans are almost silent! A quad fan pictured on the right moves about 5500 litres of air per minute. Solar powered fans are very quiet and efficient, requiring no electrician so they save both money and power. More importantly, the fans only switch on when weather conditions are right. On damp overcast days, when the humidity is high, the fan does not operate, making them much more efficient than old-style electric fans on timers, which come on in all weather conditions. All fans are rated for 50,000 hrs. Subfloor fans are normally installed along one side of the house, extracting air out from under the floor and thus drawing fresh air in on the other side. Solar powered fans require very little maintenance and run for years. Simply wipe over the solar panel a couple of times per year or arrange for the Exopest fan maintenance service. Alternatively a 12v adapter can be plugged into mains power and linked to a timer. Good subfloor ventilation also reduces the chance of attracting other wood-eating insects, such as the furniture beetle (Anobium), Dampwood borer (Hadrobregmus), wood weevil (Pentarthrum) and termites. 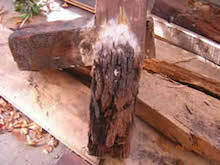 Anobium borer infests softwood Baltic pine flooring. Refer to the Borer or Termite information pages for more about these pests. Download the Envirofan information sheet. Our experts use moisture meters to measure floor moisture content and work out required air flow to comply with the Building Code Australia. Exopest supply and Install Envirofan sub floor fan systems in Melbourne. Very quiet and efficient running off Solar power or 12v adapter. All fans can run off small solar roof panel or plug in adapters 12v or 24v. No noisy 240v motors or expensive power bills! Exopest complete most installations in one day. Exopest do sell direct for Builders and DIY. Call 1800 686 299 to book a site inspection or to find out more.